Iranian President Hassan Rouhani (left) greets Turkish President Recep Tayyip Erdogan in Tehran, April 7, 2015. Time passes quickly; but most scripts at the political musicals of the Middle Eastern theaters remain stubbornly unchanged. The (neo-) Ottoman-Persian theater looks exceptional at deception, self-deception, counter-deception, attempted deception and failed deception: At least the Saudis and Iranians do not embrace and kiss each other while fighting several proxy wars in different theaters of the Middle East. The complication on the Turkish-Iranian axis has several reasons, none of which is easily comprehensible to the Western mind: Turkey's Sunni Islamists believe that they can always fool their Shiite Iranian "brothers" by smiling to their faces, by standing by them against the Christendom, and by championing the Palestinian cause -- while playing games behind their backs. In return, the Iranians privately smile and think that the not-so-smart Turks are just trying to play backgammon while they, meanwhile, calculate gambit after gambit on a chessboard. But at least there is an amazing consistency in the way Turkey and Iran have kept playing their parts in modern history, both in "Muslim brotherly" rhetoric and not-so-hidden rivalry and sectarian (cold) warfare. During an October 2009 visit to Tehran, then Turkish Prime Minister (now President) Recep Tayyip Erdogan said: "We need to establish peace in the region, and its solution is in the hands of regional countries." In return, his host, the Iranian parliament's speaker, Ali Larijani, said that cooperation between Iran and Turkey could strengthen regional security. A week before smiling hand-in-hand with Rouhani, Erdogan said that he would not tolerate Iran dominating the Middle East. Five-and-a-half years, and more than a million coffins, civil, sectarian and proxy wars, and almost daily terrorist attacks later, the Turks and Iranians went back to their wardrobes, grabbed their party costumes and started to dance to the same tunes: Turkish belly dancing to the Persian santour. Erdogan, on a fresh visit to Tehran on April 7, said that Turkey and Iran "should play the mediation role" in the conflicts in Iraq and Syria. "I don't look at the sect. It does not concern me whether those killed are Shiite or Sunni; what concerns me is Muslims," Erdogan said in Tehran. He also said that Turkey and Iran should mediate between the battling parties (in the Middle East, especially in Syria and Iraq). "We have to put an end to this bloodshed, this death," said Erdogan, perfectly performing the Turkish role. Playing his part in the drama, Erdogan's host, Iranian President Hassan Rouhani, said: "We agreed that there will be no tolerance for instability or distrust in the two countries' relations." Both leaders, as their drama roles dictate, put on generous smiles in front of the cameras. Lovely! In half a decade, the two brotherly countries have progressed spectacularly from "We need to establish peace in the region" to "We have to put an end to this bloodshed." Just a week earlier, in a more real world, Turkey and Iran exhibited serious doses of tension over the crisis in Yemen, where airstrikes by a Saudi-led coalition of Sunni countries targeted the Shiite Houthi rebels, who have taken over much of the country. Iran condemned the offensive; Turkey said Iran and "terrorist groups" must leave Yemen. 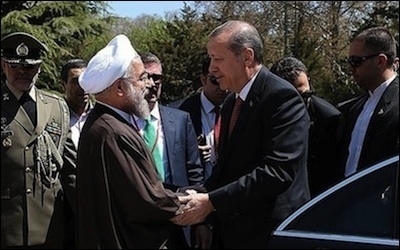 Erdogan, who hand-in-hand with Rouhani smiled to the cameras in Tehran, only the week before had said that Turkey would not tolerate Iran dominating the Middle East (read: Only the Sunnis can dominate the Middle East, preferably the Turks). In response, at least 65 Iranian MPs, in a letter, asked Rouhani to caution Erdogan "regarding his anti-Iranian remarks." That was a couple of days before Erdogan's visit to Tehran. Against that backdrop, Rouhani put the final line into this Act (who knows what number) of the Turkish-Iranian drama: "We both believed that it is necessary for us to witness the end of war and bloodletting in Yemen as soon as possible." Thundering applause. Curtain down. Until the next Act, which promises full and boring scenes of fanciful playacting. The truth about the Ankara-Tehran axis is not always as complex as the Middle East itself: Friendship and cooperation against the West and Israel; for trafficking money across the border in official and unofficial trade and for the money pouring into the pockets of both regimes' business cronies; and deep enmity along sectarian lines with historic regional rivalry on top.